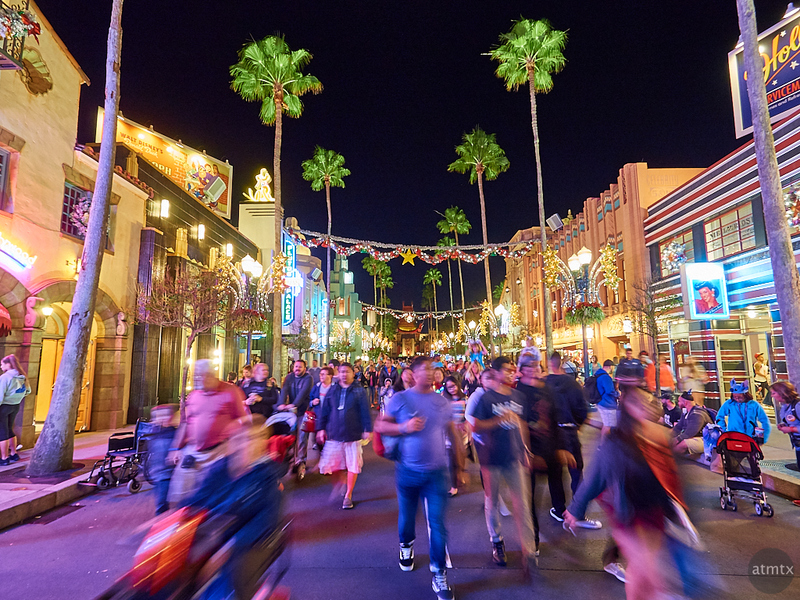 Visually, my favorite part of Hollywood Studios is the main street that leads from the entrance. The rest of the park seemed a bit sparse in comparison. One of the four Disney Parks, it wasn’t our favorite, but it has the wonderfully fun Toy Story Mania ride. Normally very crowded, we were there late and got to ride it twice. I shot this festive scene at closing time as the family shopped for souvenirs. I made the best of the crowd and further emphasized it with motion blur. It had the added benefit of making the people anonymous. You may recall, I used this technique in Chicago, to add more hustle to an already busy city. While in the past, this technique required a tripod, with modern cameras with in-body image stabilization, it’s easy. I like to use a super wide-angle lens which adds a panoramic view but also allows for slower shutter speeds. In this case, it was 1/4 of a second at a 18mm equivalent, hand-held. You want to make sure there’s enough sharp elements on screen, so that the whole thing doesn’t look like a jumbled mess.